Iowa State University's Richard Stone and Thomas Schnieders, left to right, are co-founders of the ATHENA Lab. The lab is all about using engineering to augment and understand human performance. Larger photo. Photo by Christopher Gannon. 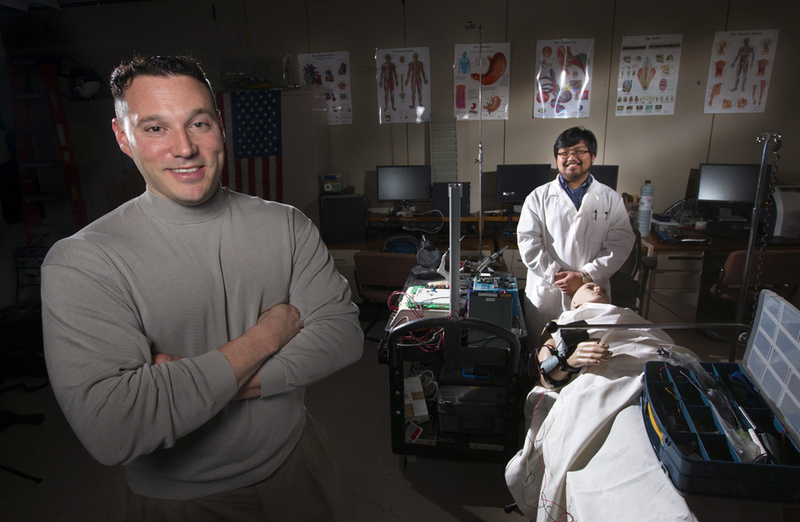 AMES, Iowa – The first thing you noticed during a visit to a new Iowa State University engineering laboratory was the full-sized mannequin lying across a table. That’s for studies to improve suturing techniques and tools. Then there was a bin full of basketball shoes. Those are for studies of tread patterns and their effects on traction and performance. Then there was a bigger-than-a-toy, remote-control land rover sitting on a shelf. It’s for studies to improve the controls for machines and robots. Back in one corner were cabinets filled with capacitors, chips and other electronics. In another corner was a roll of Kevlar for a study of body armor. Nearby was a box of cameras for recording data. There was a big fish tank for measuring volume and testing waterproofing technologies. Up on a top shelf were welding masks leftover from previous studies of welder training. Down below were groceries and other products for studies of the best placement of UPC codes on packaging. “We have lots of different projects and we’re always doing something here,” said Thomas Schnieders, a master’s student in human computer interaction and industrial engineering who’s also the co-founder and coordinator of Iowa State’s new ATHENA Lab. That’s the Augmentation and Training of Humans with Engineering in North America Lab. Stone and Schnieders established the ATHENA Lab in November 2015. It grew out of Stone’s previous lab, the Human Performance and Cognitive Engineering Lab, established when Stone came to Iowa State in 2008. The new lab is now recognized by the Augmented Human International Conferences Series as one of four augmented human research labs in the world and the only one in North America. Stone said developing more effective and comfortable body armor for soldiers and police officers is an example of augmented human research. Another example is figuring out better and faster training routines for welders. Schnieders, for example, is working on an exoskeleton designed to help soldiers and police officers learn to fire handguns. The training tool is made of sheet metal and wraps around a wrist like a sleeve. It’s designed to help trainees quickly develop the muscle memory for skillful and accurate shooting. Wear the exoskeleton, and it’s a little like a firearm instructor holding your hand to help with wrist and finger control. The technology could be paired with a laser gun, making training easier and cheaper than live-fire exercises, Schnieders said. The lab is spilling over with other projects and data-gathering tools. It supports the research work of 13 graduate students. It also supports courses in occupational biomechanics, human factors, applied ergonomics and work design, cognitive engineering and human factors in product design. And it supports the idea that engineering can augment human performance and help to understand human capabilities. Iowa State's ATHENA Lab is full of sensors, tools and research equipment, including a full-sized mannequin for studies of suturing techniques. Richard Stone, Thomas Schnieders and a team of graduate students use the engineering lab to find ways to augment human performance. That includes developing better ways to train welders, design body armor or place UPC codes on packages.